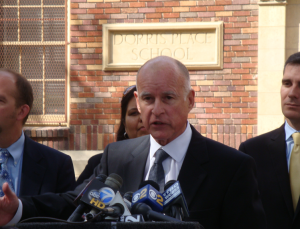 Back in April this year, nearly 800 civil society groups formed a coalition to urge California Governor Jerry Brown, to take immediate action against fossil fuel extraction in the state before his term ends. The campaign kicked off five months before Brown’s “Global Climate Action Summit”, which will occur in San Francisco next month. In a video to promote the summit Brown says we all have to fight the forces of carbonization. A letter from the civil society campaign to Brown sent in April read: “In September, as you welcome the world to San Francisco for the Global Climate Action Summit, you have an opportunity to set the new standard for global climate leadership.” It called on Brown, who has positioned himself a leader on climate change, to ban new oil and gas permits and to announce a phase out of fossil fuel production in the state. On September 8, to coincide with the Climate Action summit, thousands will march in San Francisco for the largest climate march the West Coast has ever seen. If Brown needed any other prompting of the need for urgent climate action, then the wild-fires that have ravaged large parts of California are a brutally painful reminder of what climate change looks like. The fires, which have become the largest in the state’s history, are expected to burn until the end of this month. As the fires still burnt, last week climate activists erected a mock “oil derrick,” blocking the entrance to the garage at the State Capitol as part of a day of protest against Brown. Brown’s hypocrisy is plain to see. Whereas he says he is a climate leader, since he has been state Governor, his officials have approved over 21,000 new oil and gas wells. And the drilling of those wells is causing climate change. Something that is set to get worse. The report also concluded that City heatwaves could lead to two to three times as many deaths by 2050, or some 11,300 additional deaths. In response to the assessment, Jerry Brown stated that “These findings are profoundly serious and will continue to guide us as we confront the apocalyptic threat of irreversible climate change”. One simple action Brown could do is stop drilling for oil and gas. He cannot warn of an apocalyptic threat of climate change and be a force for carbonization at the same time by carrying on drilling. He is running out of time to be a true climate leader. This really is Brown’s last chance.